Jumpin’ Jackie, Hammond Gone Cha Cha, Meets The Trombones, Tiger On The Hammond & Big Beat Hammond. Containing the LPs; “Jumpin’ Jackie”, “Hammond Gone Cha Cha”, “Meets The Trombones”, “Tiger On The Hammond” & “Big Beat Hammond”. AVID Jazz continues with its four classic album series with a re-mastered double CD release of five classic albums by Jackie Davis, complete with original artwork and liner notes. 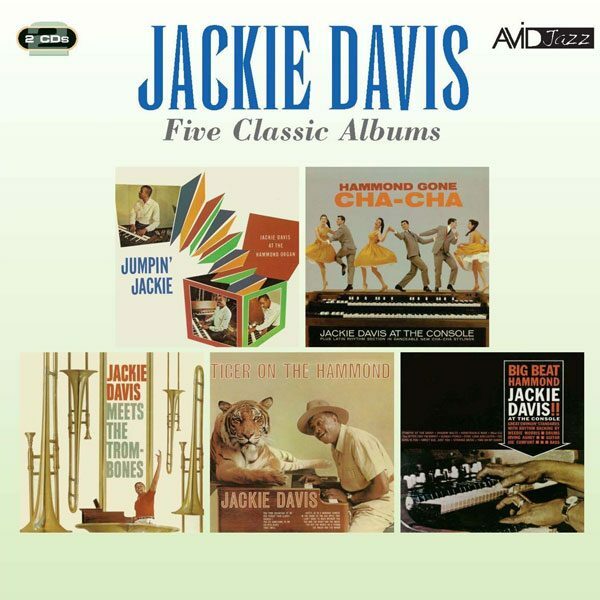 Contains the LPs; Jumping’ Jackie (1958), Hammond Gone Cha-Cha (1959), Meets The Trombones (1959), Tiger On The Hammond (1960) and Big Beat Hammond (1962). Who do you think of when the subject of the Hammond organ in jazz comes up? If you had asked us here at AVID a while back we would have probably shouted Wild Bill Davis, Bill Doggett or Jimmy Smith! However that was until we discovered an unsung genius of the Hammond organ through an enthusiastic jazz listening customer who pointed us towards a certain Mr Jackie Davis. Himself influenced by both Davis and Doggett, Jackie Davis’s solo career began in 1951 where he was playing the clubs around Philadelphia. Regular touring around the U.S. led to the Hammond organ fast becoming his trademark instrument. Signed at first to Capitol records where he made many fine albums, he was later to sign to Warner Bros. His increasingly wild albums covered many musical areas but were always rooted in the jazz tradition. Jackie Davis was a very influential ambassador of the Hammond organ who can certainly be named as one of the real innovators on the instrument. His quoted disciples include both Shirley Scott and the great Jimmy Smith. What Can I Say After I Say I’m Sorry? Alan Ashton pointed me in the general direction of this new re-release by the legendary Hammond organist Jackie Davis just before its release. I thought it would be a popular addition to our catalogue and indeed we have sold quite a few copies since its debut on July 1st. You may think it was released on the Jasmine label as they’ve produced quite a few Hammond discs in this vein including Jackie, Buddy Cole and Lenny Dee (although nothing since 2013), however it’s not and this is the first title we have stocked from classic CD re-issuer AVID Jazz (as it’s their first organ issue). AVID have managed to cram, not one, two, three or four LPs onto this set, but FIVE! These span just five years from 1958-1962. He also did another two LPs during this time which aren’t included, so he had a pretty heavy output back then. The albums included here are; Jumping’ Jackie (1958), Hammond Gone Cha-Cha (1959), Meets The Trombones (1959), Tiger On The Hammond (1960) and Big Beat Hammond (1962). The booklet also includes the original artwork and liner notes, although you may need a magnifying glass to get the full benefit. As you can probably tell from the titles, the LPs vary in styles, but overall they all have the Hammond as the star of the show and pushed well in the foreground. Obviously there is more of a latin feel and instrumentation on the “Hammond Gone Cha-Cha” tracks and everything’s a bit more brassy on the “Meets The Trombones” ones. Many of the tracks may not be that recognisable, but there are many organ standards too, some of which became standards due to their appearance on these LPs. The more recognisable titles include, “Moonlight Becomes You”, “Ain’t She Sweet”, “Perfidia”, “Frenesi”, “Falling In Love With Love”, “Fascinating Rhythm”, “This Can’t Be Love”, “Thou Swell”, “I’ve Got The World On A String”, “Stompin’ At The Savoy”, “Honeysuckle Rose”, “Sweet Sue, Just You” and “Time On My Hands. All the tracks are played in Jackie’s laid-back jazz style, but they’re not so jazzy as to put off any middle-of-the-road organ listener. This is a great set and, with a running time of two hours and forty minutes, it is extremely good value for money. Considering their age, AVID have done a great job transferring the LPs to digital as the sound is crisp and clear. I hope they plan to do a few more Hammond re-issues as they’ve made a top job of this one. FULL TRACKS: JUMPIN’ JACKIE: Across The Alley From The Alamo • Darn That Dream • I Got The Sun In The Morning • I Wonder When My Baby’s Coming Home • Isn’t It Romantic • What’s The Trouble • I’ve Hitched My Wagon To A Star • So Beats My Heart For You • Jumpin’ Jackie • Moonlight Becomes You • I’d Love To Take Orders From You • Coffee Time • HAMMOND GONE CHA CHA: Ain’t She Sweet • A Woman In Love • Rain On The Roof • Heat Wave • In A Little Spanish Town • Then I’ll Be Happy • Lady, Play Your Mandolin • I Got Plenty O’ Nuttin’ • The Glow-Worm Cha Cha Cha • Perfidia • Love Is Just Around The Corner • Manana • MEETS THE TROMBONES: Yours Is My Heart Alone • Frenesi • When I’m With You • My! My! • There’s Something In The Air • Charleston Alley • Falling In Love With Love • Gonna Get A Girl • Fascinating Rhythm • This Can’t Be Love • TIGER ON THE HAMMOND: You Took Advantage Of Me • You Forgot Your Gloves • Should I? • You Do Something To Me • Calypso Blues • Thou Swell • Softly, As In A Morning Sunrise • In The Shade Of The Old Apple Tree • I Don’t Want To Walk Without You • You And The Night And The Music • I’ve Got The World On A String • The Major And The Minor • BIG BEAT HAMMOND: Stompin’ At The Savoy • Shadow Waltz • Honeysuckle Rose • What Can I Say After I Say I’m Sorry? • Sunday Punch • Stop, Look And Listen • The Song Is You • Sweet Sue, Just You • Strange Music • Time On My Hands.